A thing of beauty is always fresh, vital, principled, and divine. 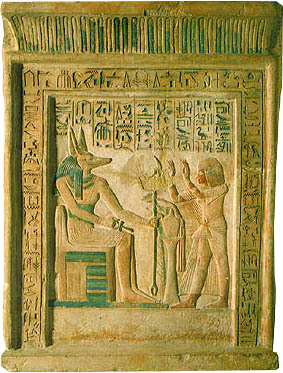 Stele scene in which Ipi, a royal scribe, worships the God Anubis, Mid-14th century BC., Ancient Egypt. At the State Hermitage Museum, over 180,000 items including paintings, sculptures and examples of applied art, give an idea of a remarkable cultural heritage of the Orient from the time of the ancient civilizations emergence to the present. This oriental artworks occupy 50 rooms and contains pieces from Egypt, India, Iran (Sassanian), Tibet, Byzantium, and countries of the Near and Far East. The collection include silver filigree objects of the 17th - 19th centuries of China, India and South-East Asia, and Sassanian silverware (Ewers, dishes, etc.). Head with Ringlets and Earring, Eastern India. Asking Her to Leave Her Noisy Anklets and Go Manaku of Guler, India. Lady Carrying Fruits Ravi Varma, India. "We are the same as plants, as trees, as other people, as the rain that falls. We consist of that which is around us, we are the same as everything. Your work is to discover your world and then with all your heart give yourself to it." Buddha. Chinese Stem Cup, XVth century. "The flower is a jumble of thighs, the sun's harem - the most oriental thing imaginable." Malcolm de Chazal. "A nice cottage. A clean table. A clear sky with a beautiful moon. A vase of flowers. No cares of the world." 15th century Chinese writer. "Making contemporary art can throw up obstacles but it does not worry me. I am eternally optimistic; I am Chinese." Cai Guo-Qiang. Horse and Groom, by Haydar Ali, early 16th century, Iran. Progress through Education by Carlos V. Francisco, Philippine. Dragons symbolize wisdom, virtue and strength. Persian miniature, Harun al-Rashid in "Thousand and One Nights". Oriental art. State Hermitage Museum. Art in Southeast Asia Sweet Briar College, Virginia. East Asian art Harvard University. Highlights from the Collection: Iran The Oriental Institute, University of Chicago. About the Asian collections. The Victoria and Albert Museum, London. Hexagonal tile with floral decoration, 1540 - 1545, Turkey. Framed medallion, Byzantine Empire, 500–700. Turkey. ↑ A THEORY OF ORIENTAL AESTHETIC By Kenneth K. Inada. ↑ Oriental art. State Hermitage Museum. ↑ Asian Art at the Met. Base of the Elephant Terrace, Angkor, Cambodia. Mohd Hoessain Enas, Minah, 1958, Malaysia. This page was last modified on 2 September 2016, at 09:56.